How many of you have lost your significant other to the re-start of the football season? Matt loves the NFL, especially our hometown Atlanta Falcons, and he tops it all off with multiple fantasy football teams. You may love football too, which is great. But for me, growing up with 5 brothers, football became a yawn fest for me. But I love Matt and he needs his down time too, so I try to muster up the strength to support him through a game or two each week. 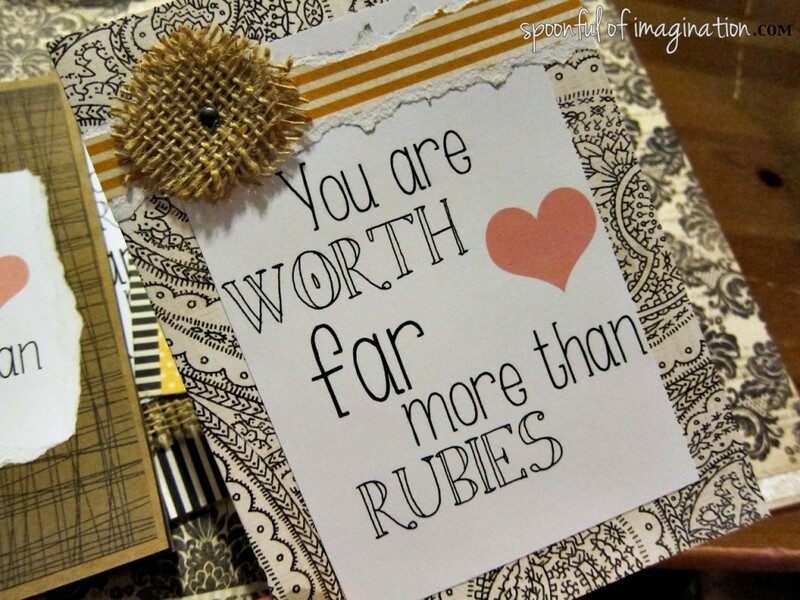 What I have found is that this can be an amazing few hours of crafting time. I don’t know about you, but I love when I can “find extra time” to create. So as Matt settles into a game, I start-up my craft on the other couch. We still get that time together but get to both focus on something we enjoy. I started by folding one of my big pieces of scrapbook paper in half and measuring how much needed to be cut off, so it fit perfectly in my envelope. For other cards I used my cardboard cardstock. 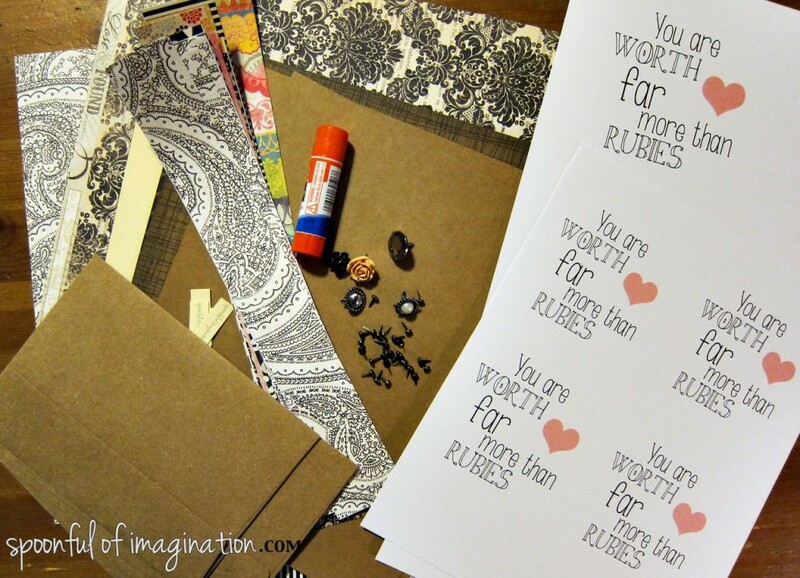 The main idea here is to use a thick piece of paper to give it a real greeting card feel while also providing a sturdy pallet for all the embellishments. 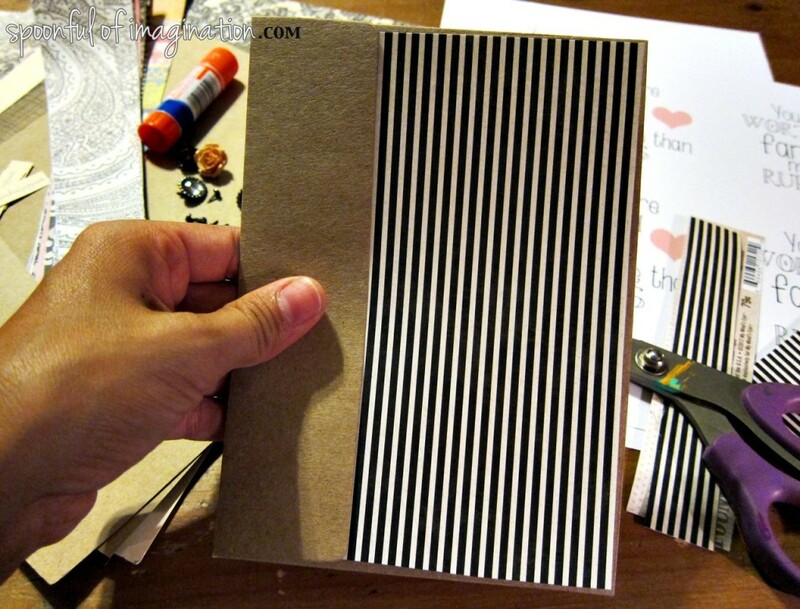 Once I had the size of my card, it was my blank canvas to decorate. I started on my first card by ripping the edge around one of my graphics to add a fun textured look. I cut a piece of burlap slightly bigger than my ripped graphic. I pulled a few strands off the ends of the burlap to create a more fringed look, and used a mini round brad to attach both the graphic and the burlap to my folded card. 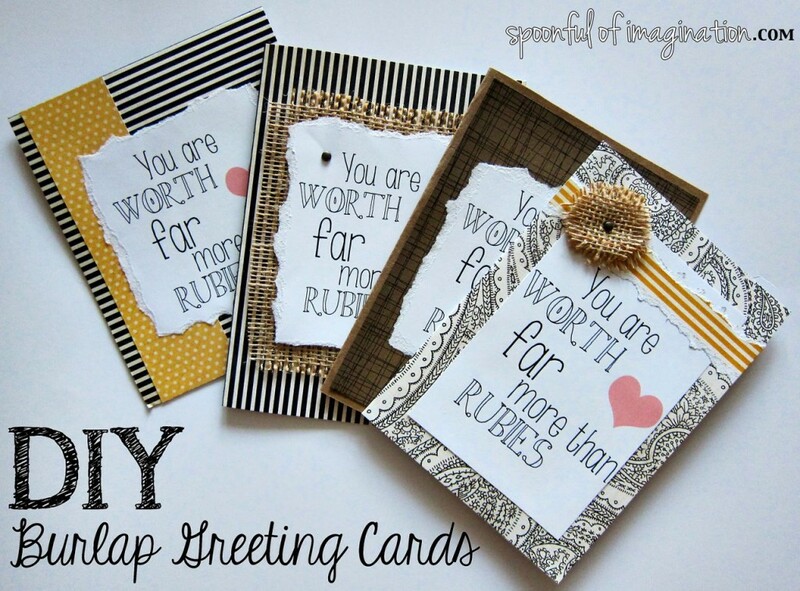 I love the layer look and the mix of frayed edges with the clean straight lines of the card’s background. I started playing with my paper and came up with a few other designs. 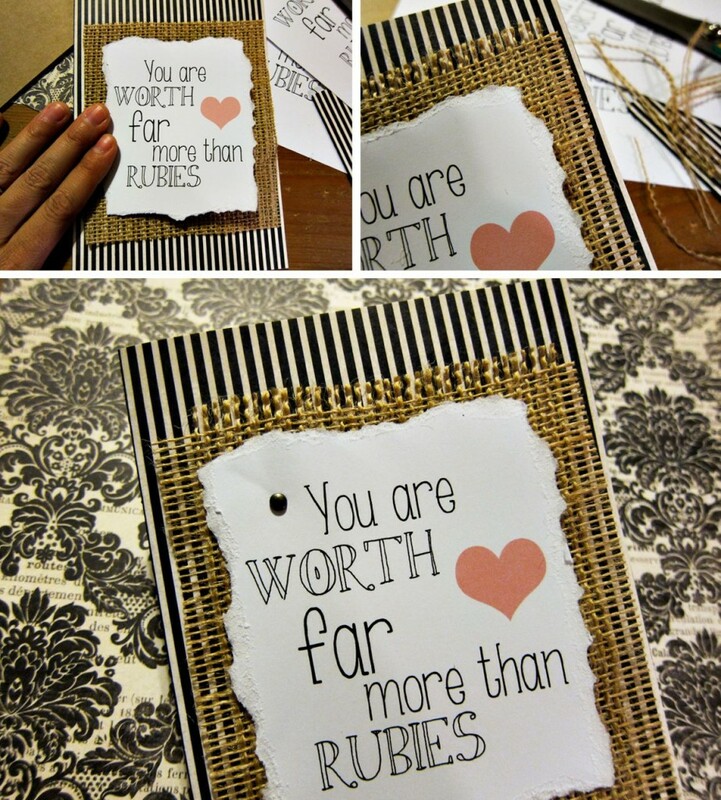 This next one, I cut the graphic out with straight lines (rather than the ripped technique) and glued it to the card. I then ripped a decorative piece of paper to border it. and glued it on top. Lastly, I cut out small burlap circles, pulled out a few strands again (to create a fringe), and used a mini round brad to attach the burlap flower to my card. I made these so quick. I love the textured look with the burlap, but you can keep your design even simpler. The following two I created with just scrap paper and glued them on the card with my graphic. These cards are all 5″ x 7″, but I then made some easy smaller ones as well. 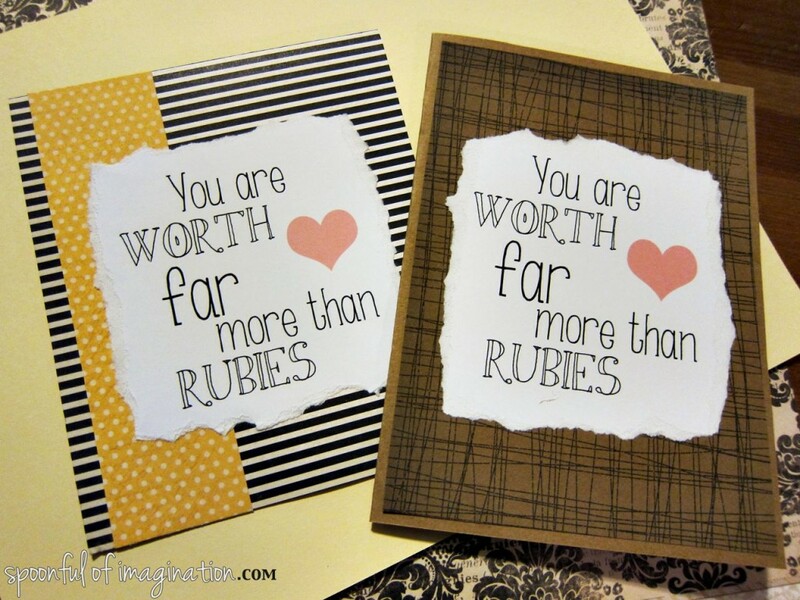 There are so many possibilities and designs when creating cards with just a few supplies. These were so easy to make. You could of course create your own printout with a special saying, quote, or picture and that opens the door for even more possibilities. You could also do the same techniques but put it in a frame rather than on a card like I did for my sister here. I feel like I have been tired and trying to figure out the new normal routine with school here. I don’t think I am alone, as I have seen FB messages and Instagrams of others in the same boat as me. 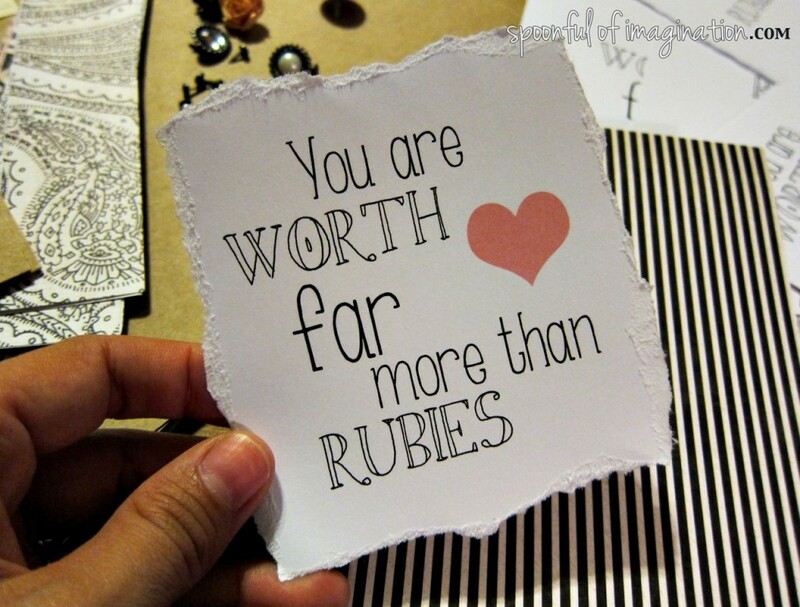 I am excited to share this valuable truth with all of you, You Are Worth Far More Than Rubies. I created this graphic for you to use and create your own cards. Click here to download the larger graphic I used for my 5x 7 cards and click here to download the graphic for smaller cards. Enjoy! I plan to write a few friends this weekend. 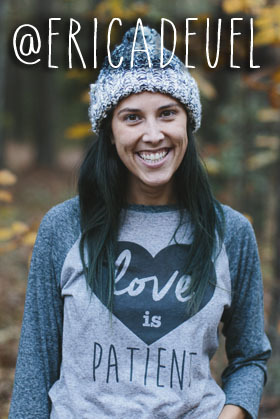 Do you have friends that could use some encouragement? 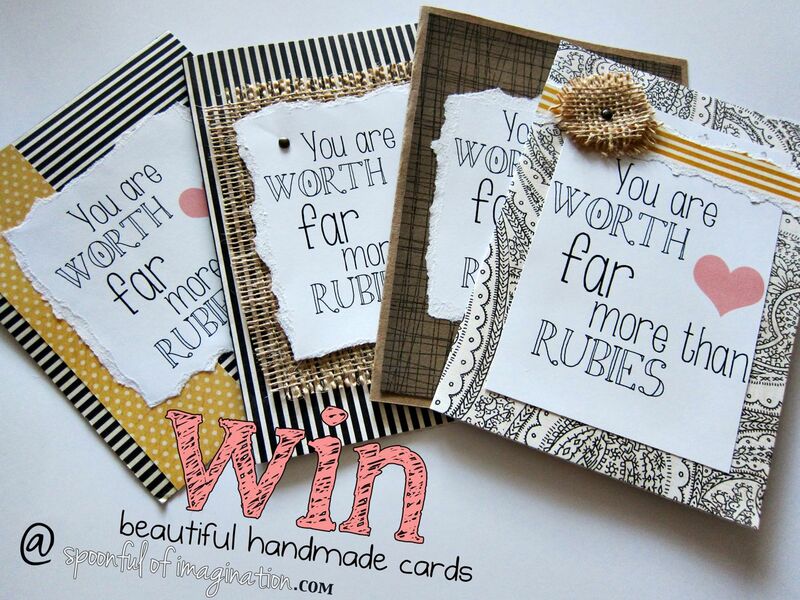 Share this post somehow through social media, let me know how you did in the comments below and you’ll be entered to win a set of these cards to send out to your friends. I’ll randomly draw a winner on Monday for the first four 5″ x 7″ cards I shared on here. Thanks so much for stopping in. I hope you have a great weekend and are able to add a spoonful of imagination into your day! Lol!!! Just seeing this!!!! 😉 wah!!! I didn’t win! Boo!! Congrats to the winner though!! Loves to you girl! These are adorable! 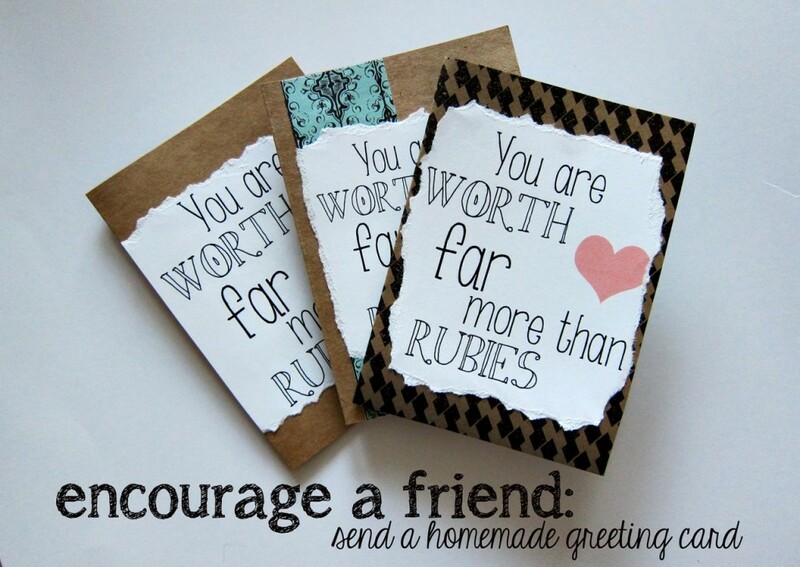 I would have never thought to use burlap on cards – but its genius! 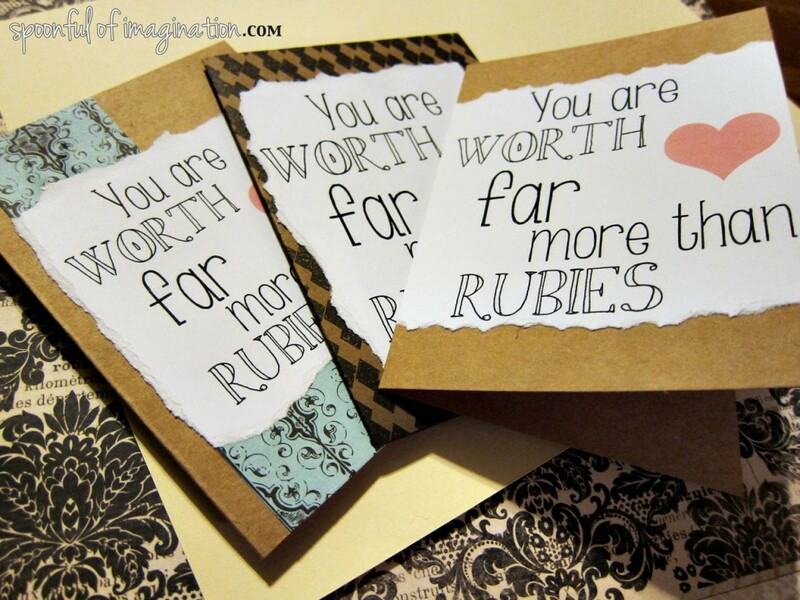 Love the look of these, but even more, the message! Shared on FB. I shared on Twitter! I think they are absolutely fabulous!!! !